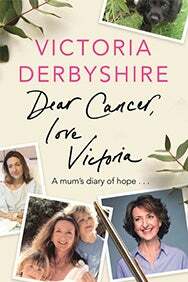 We do not curently have theatre tickets available for Dear Cancer, Love Victoria This could be because we have simply sold out or it could be that this show is no longer running. The information on this page remains purely for historical and informational purposes. A much-loved and highly respected BBC journalist, Victoria Derbyshire has spent 20 years finding the human story behind the headlines. In 2015, she herself was in the news, after receiving a devastating breast cancer diagnosis. With honesty and openness, she decided to live out her treatment and recovery in the spotlight in a series of video diaries that aimed to demystify the illness. The diaries have so far amassed 17 million views. Victoria's story is an affecting and at times heart-breaking one but it is so often laugh-out-loud too. Moving, wonderfully heart-warming and ultimately uplifting, this is a powerful account of a brave struggle told with honesty, courage and emotion that gives strength to anyone touched by cancer. Join Victoria for an evening of conversation, questions, answers and above all, openness.